Tag Line: "In this issue: Learn WHY J. Jonah Jameson REALLY Hates Spider-Man!" New York is besieged by fantastic crimes being planned by "the Big Man". He even manages to give Spider-Man a wrong turn and we are constantly led to believe his real identity is J. Jonah Jameson. The Big Man uses his trio of Enforcers to pull the mobs in line: Ox, the big strong guy; Fancy Dan, the short but quick and deadly little guy; and Montana, the medium-size guy with the only weapon in the group--and it's not a gun. The bad guys fight Spider-Man twice in this issue. The first is just an intro-bout, just to size up the opposition and give us a taste for what's to come. 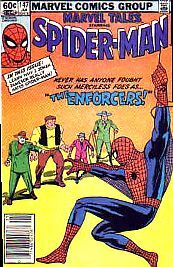 Then, after an interlude with Betty Brant (Spidey's then-love interest), we see some old-fashioned threatening and Peter Parker gets taken hostage because he claims to know who the Big Man is (thinks he's JJJ). He escapes as Spider-Man, and starts the main event. Eventually even Spider-Men get tired, and he has to call for the police for help. The Big Man decides to take it on the lam, but eventually gets caught by the police later, who saw him speeding away from the scene. And when we find out the Big Man isn't JJJ (big shock), we do have a nice little soliloquy with JJJ confessing why he hates Spidey. Turns out he's been jealous of our favorite wall-crawler. The Good: Action, action, action! 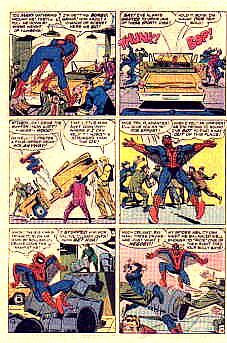 I love the old Lee/Ditko stories, they're still very readable, even today. 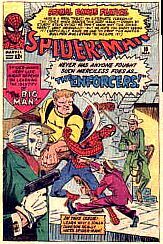 The Enforcers make a great team to set against Spider-Man, given their disparate abilities. What is interesting is that they don't constantly bicker between themselves, like you see in the villains (and heroes) of today. That gets tiresome. I also like the fact that the Enforcers are menacing and provide all this action without one of them having a gun. It's refreshing these days -- you can still give a kid a Spider-Man comic and it's not all about gun-toting vigilantes. True, the Big Man used a gun, but he was the one who got caught in the end. The Bad: I don't know why they chose to print the cover as they did. At least they gave an alternate cover at the end of this issue... anybody out there have an ASM #10--did they print this cover in the original too? I never understood how they built up Peter and Betty Brant's relationship. It seemed like she would've been too old to date a high school teenager. We'd see more of Betty as it turned out she married Ned Leeds, who later became an incarnation of the Hobgoblin (sort of). But that's another story. Jameson really hates Spidey out of jealousy? Lame. I like the explanation that his first wife was killed by a masked man (as in the Fox Animated Spider-Man TV cartoon) a lot better. Overall Rating: 3 chees. Great action. The mystery in the story ("Who IS the Big Man?") doesn't really give us much of a mystery anymore, because let's face it--we know JJJ's future. The real mystery now is, -- whatever happened to the Enforcers?